Living on Flagler’s lands? You probably are. I often wish I could build a time machine and see Palm Beach County as it was in the late 1890s. One thing is for sure though – I better have some good wading boots with me. Almost all of the land would have been under water during the rainy season from June to November. So who would want all that swamp land? Henry Flagler would – and he got most of it for free. Model Land Company ad from 1924. (now the Weaver Canal). This also meant all lands were now part of a “taxing district” and owners had to pay a yearly drainage tax on land that was not producing anything. Check your tax bill – chances are you are still paying a tax to the Lake Worth Drainage District if you own land in their area. Once work was largley finished by 1921, the land was sold in farming size tracts of many sizes. The Model Land Company was formed in 1898 and was led by J.E. Ingraham, whom Flagler recognized as having good business sense. 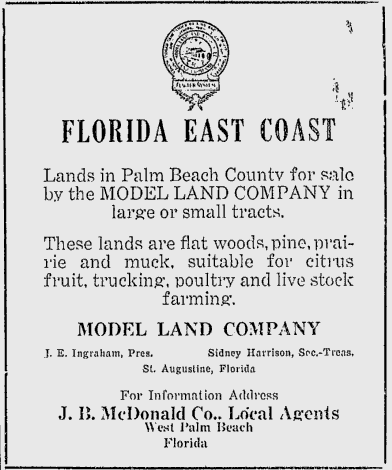 The Model Land Company sold land up and down the east coast of Florida from the land Flagler amassed through the railroad. Flagler never made any money on his hotels, and the railroad itself was a financial disaster from day one. The land sales, however, kept everything else afloat. As individual settlers bought various land tracts from the Model Land Company, they probably farmed on it or leased it out to bigger agricultural concerns. Gradually, tracts were sold and consolidated until finally landing in the hands of developers. From the 1930s to the 1970s, these developments were more of the City of Atlantis-type where streets and utilities were laid and individual lots sold for a house custom-built for the owner. From the 1980s to today, the developments are the typical “cookie-cutter” variety with three or four models from which to choose. As I searched through the online archives of the Model Land Company (available at http://merrick.library.miami.edu/specialCollections/asm0075/) I found a letter dated February 3, 1923 that mentioned a land owner who wanted to sell his tracts (all the land between Military Trail and Lawrence Roads from the Boynton Canal south to where Woolbright Road is today) to Norwegian settlers. The owner could not afford the drainage taxes and would eventually lose the land. He wanted the Model Land Company’s help in getting a road built through the land. A community center was to be built in the center of the tract. Hard to imagine we could have had a little Norwegian village with 100 families in Palm Beach County. A June 14, 1923 article from the Palm Beach Post proclaimed “Norse Colony to be formed near Boynton.” I don’t know if the families ever came, or whatever happened to the idea. That is a mystery to be solved. One Response to Living on Flagler’s lands? You probably are. Love that link to the Model Land Company archives at UM. I didn’t know they had that. Lots of other interesting digital collections there too. Thanks for the link!